Lucie Manette was born in the Dark half of the city, but careful manipulations won her a home in the Light, celebrity status, and a rich, loving boyfriend. Now she just wants to keep her head down, but her boyfriend has a dark secret of his own - one involving an apparent stranger who is destitute and despised. Lucie alone knows the young men's deadly connection, and even as the knowledge leads her to make a grave mistake, she can trust no one with the truth. Blood and secrets alike spill out when revolution erupts. With both halves of the city burning, and mercy nowhere to be found, can Lucie save either boy - or herself? I requested Tell the Wind and Fire because of Sarah Rees Brennan. Last year, I really enjoyed her Lynburn Legacy series and I wanted to give her new novel a try, thinking I will be in for more paranormal action and romance. I came away feeling slightly disappointed. 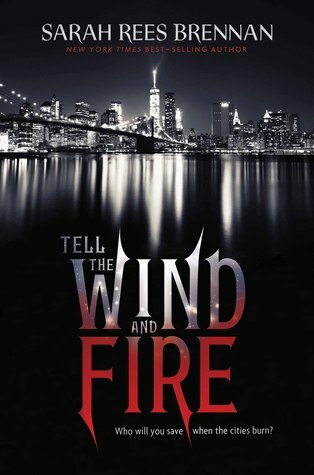 Tell the Wind and Fire is a retelling of Charles Dickens' A Tale of Two Cities. Set in a fantastical New York where Light rules in luxury and suppresses the Dark to specific areas, Lucie Manette is a child of both worlds. She was born in the Dark but through a series of events, was transferred into the Light with celebrity status and a golden boy as her devout and loyal boyfriend. Things were going well for Lucie until her boyfriend is accused of a crime punishable by death and the only boy who can save him is someone who will probably unleash more trouble than he's worth. Firstly, the writing style is very much Sarah Rees Brennan: easy to read and charming in its own way. The world building is very intriguing to start with, and I enjoyed how New York City has been divided by magic. Lucie's backstory is also set up quite nicely and I liked how she can sort of see things from both sides of the coin. However, those are pretty much all I enjoyed about the novel. 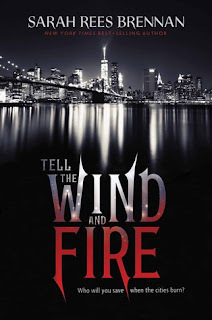 The main issue I have with Tell the Wind and Fire is that as a retelling of A Tale of Two Cities, it forces itself to follow the storyline of the original classic and the end result is very awkward and confusing at times. There is a lot of info-dumping throughout the book because unlike the original tale where the reader is already familiar with the English lifestyle and the French revolution, Brennan had to introduce the reader to the world as well as the story. Unfortunately, instead of showing it to us, the information was just narrated by Lucie in large chunks. Also, because the storyline seems to almost propel itself towards the finale, the main characters are not very relatable. None of them are very well developed and as a result, I didn't feel particularly drawn to any of them. And the chemistry? It all felt a bit forced and insta-love (one of my biggest bookish pet peeves). Ultimately, the ending also left a lot to be desired. While I understand that's how A Tale of Two Cities ends, after how this story has unravelled, the ending just felt very unfinished, almost as if there will be a sequel coming up. If there is, I'm not sure I will pick it up. In conclusion, I really struggled to enjoy this book. There are elements that I enjoyed but overall, the story really didn't work for me. Disclaimer: a complimentary eARC was provided to me by the publisher via NetGalley in exchange for an honest review. The views expressed above are entirely my own and are in no way affected by the source of this book. Oh bummer. I was slightly curious about this one, but now I am thinking I might just stay away. I never read this inspired classic and really don't feel like it to be honest. Not that it sounds like it's required to read this one, but it sounds like it's a straight up retelling with very little twist, just a bit of modernity and fantasy. I might just have to skip this one. Nice honest review all the same!